First, the musculoskeletal structure of the body is compromised. The body is an intelligent organism that depends on a dynamic arrangement of tension, levers, hinges and balance to maintain function. If one of these components is compromised, the body compensates by changing the structure. This change also stresses the normal anatomy to which the body must adapt. Pressure on nerves causes irritation and tension with deranged function as a result. Why not release the pressure? Why not adjust the cause instead of treating the effects? Why not? O ne thing that is commonly observed is the change in posture. New habits are formed like forward head posture which strains the neck muscles and straightens the cervical curve. The head will tilt to one side, typically one shoulder will be higher then the other and the hips will also be uneven. This change in posture can create weak points in the lower back that may cause a person to be prone to low back pain and disc problems. 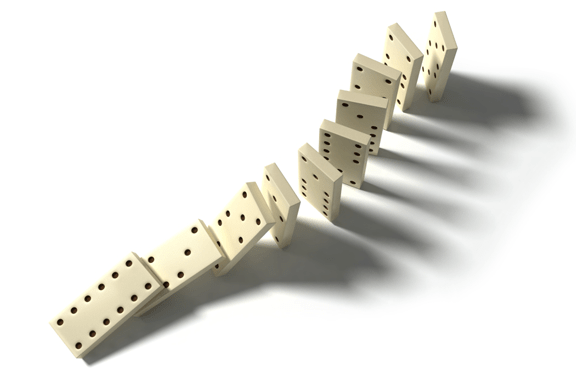 Like a row of dominos – when the first one drops, the rest will follow. This downward spiral can be stopped and many times the body can “straighten” back up. There are many factors to consider but most people will benefit greatly by being in proper alignment.